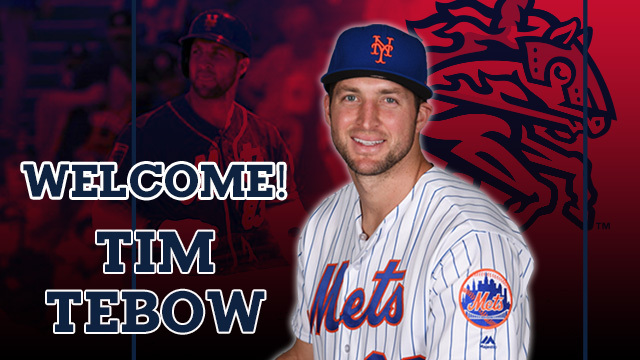 BINGHAMTON, NY - The Rumble Ponies are pleased to announce outfielder Tim Tebow will start the season in Binghamton, proud Double-A affiliate of the New York Mets. Tebow is slated to make his debut when the Rumble Ponies open the 2018 season with a seven-game homestand starting Thursday, April 5 at 6:35 PM at NYSEG Stadium. Tickets for the Ponies first homestand of the season can be purchased by visiting the Rumble Ponies website (www.BINGRP.com), calling the Starting Gate Box Office (607-722-FUNN), or visiting NYSEG Stadium (Monday-Friday: 9 AM - 5 PM, Saturday (3/31: 10 AM - 4 PM). "I'm excited to take the next step in my baseball career by playing for the Rumble Ponies," said Tebow. "I look forward to getting to play in front of the Binghamton fans and around the Eastern League." "This is yet another win for this community," said team president John Hughes. "It is an honor the New York Mets entrust the team and this community to assist in the development of their top prospects. We are eager to welcome Tim and the rest of the Rumble Ponies players to the Southern Tier in pursuit of the Eastern League title." Tebow, a non-roster invitee to Major League Spring Training this year, split last season between the Columbia Fireflies (Low-A) and St. Lucie Mets (High-A). He compiled a .226 batting average, hit eight home runs and collected 52 RBI over 126 games in his first full season of professional baseball. Tebow signed with the Mets as a Minor League free agent in September 2016. Tebow played in 35 games in the NFL with the Denver Broncos (2010-2011) and New York Jets (2012). In four years at the University of Florida, Tebow won two National Championships and the Heisman Trophy as a sophomore in 2007.